Congratulations! The jurors have selected your entry as a Final Selection in this year’s London International Creative Competition. Your work has been recognised for its excellence in originality, creativity, excellence of execution, and overall impact. 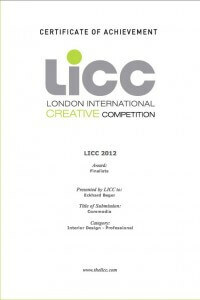 Your work will be featured in our annual LICC book which will be available in 2013. In addition we hope you will be able to join us for the annual London International Creative Awards (LICA) event that will celebrate the winning works of the 2012 competition. More details surrounding the LICA event are forthcoming. On behalf of Founder, Hossein Farmani, and myself we would like to congratulate you once more on being recognized as one of this year’s to creative talents! We truly appreciate your participation in this year’s competition and with your help our fourth year has been a tremedous success!